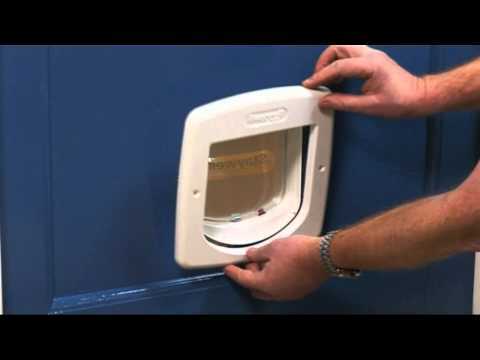 How do I programme or delete my cat’s collar key for the 500 Series Deluxe Infra-Red Cat Flap? Install 4 AA batteries into the cat flap. Install batteries in the key. To the left of the circuit board on the flap, there are two buttons, ‘Manual’ and a ‘Learn’ button. Press the ‘Learn’ button and hold the key up to the door. The LED light on the cat flap should start to flash green. The key is now programmed. Repeat the steps above to programme more than one collar key. Press the ‘Manual ‘ and the ‘Learn’ button together for a couple of seconds. These buttons are located to the left of the circuit board on the flap. This will wipe out the previous memory. The door will not recognise the collar key for the 500 Series Deluxe Infra-Red Cat Flap. You’ll need to power down and reset the circuit board. Take the batteries out for at least 30 minutes. This will clear the circuit board memory. Put the batteries back in. The red LED light should flash. Hold the key up to the flap. The cat flap will then make a high pitched beep, which means the key has been programmed in. When you hold the key up to the cat flap again, the latch should drop down and you should be able to push on the flap to open it. When you take the key away, the door should lock. How far away does my cat have to be for the key to activate the lock for the 500 Series Deluxe Infra-Red Cat Flap? The key activates from up to 20 centimeters away from the flap. While your cat is in this range, the latch will stay down to open the door, and when your cat is out of range, the latch will go into the up position and lock the cat flap.